Posted on July 3, 2018 - By Fucosoft | Follow YouTube, Twitter to Get More Information. YouTube is undoubtedly the most widely used video sharing website in the world. It allows users to view, upload and share videos, but if you want to take videos offline, sorry, YouTube doesn’t allow users to download videos. Luckily, there are alternative ways to download songs or videos from YouTube to view them later. You can install desktop software if you download videos regularly, but if you just want to download a single clip then YouTube video downloader online site is ideal. Here in this article, we’ve rounded up the list of the 5 best Free Online YouTube Downloaders from where you can free download YouTube videos instantly. When it comes to download videos from YouTube, SaveFrom is always my favorite tool. It is free online YouTube Video Downloader which lets you not only to download videos by entering URL, but to download using short domain name: ssyoutube.com. For example, if your video URL is: https://www.youtube.com/watch?v=v6NsqAUfO0Y&t=1s, visit this URL: https://www.ssyoutube.com/watch?v=v6NsqAUfO0Y&t=1s and get download link of your video. Also, you can install SaveFrom.net Helper for Google Chrome to download videos in one click. 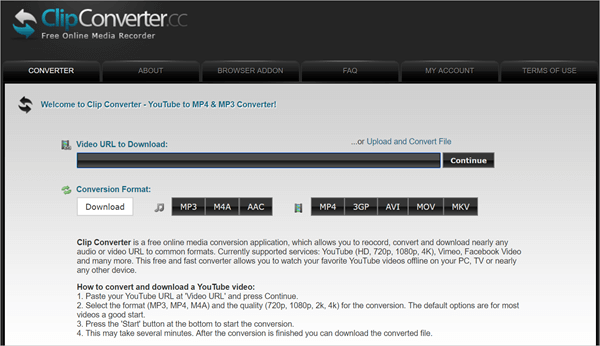 ClipConverter is another online tool to record, convert and download YouTube videos to common formats for free. Similar to SaveFrom, you just copy the URL of your desirable video from YouTube and browser clipconverter.cc. Paste the URL at the “Video URL to Download” box and click “Continue”. After that, click “Download” button to download YouTube videos in MP4, 3GP, AVI, MOV, MKV and even audio formats like MP3, M4A, AAC too. Besides, the ClipConverter Browser Addon adds a button on YouTube pages to convert and download videos directly. 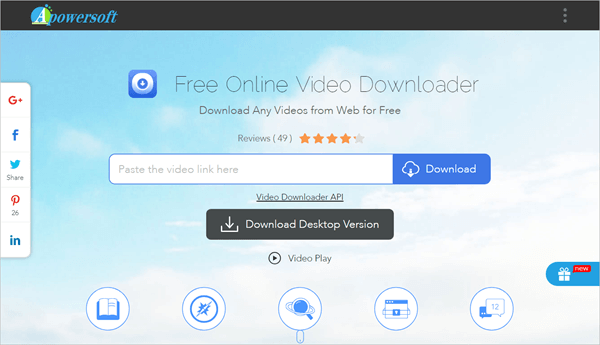 Apowersoft Free Online Video Downloader lets you download YouTube videos on your computer so that you can watch them offline. It is fully compatible with all popular browsers including Google Chrome, IE, Firefox, Opera, Maxthon, etc. Above all, it requires no installation or signup. You just need to copy and paste the video URL, then choose the output format and quality that you want to download. With this YouTube Downloader HD online tool, you can download videos in MP4, 3GP, FLV, WMV, MP3, WEBM, MOV, etc. and save HD videos for your reference. 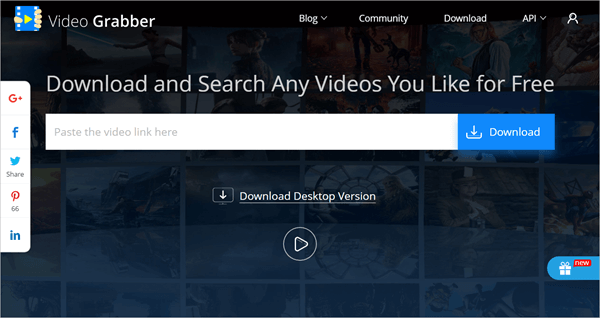 Video Grabber is another top rated YouTube video downloader online site to get your desired videos downloaded for free. Not only YouTube, this site also lets you download videos from Vimeo, Facebook, Vevo, Dailymotion, VK, Google Video and many other video sharing sites. You just need to copy the video URL and paste it in the appropriate slot on the site, then hit the “Download” button and save the video to your computer. Moreover, it offers you other important tools such as screen recorder, video converter, etc. CatchVideo is a java-based online YouTube video downloader which means your browser should have java enabled in order to download YouTube videos. It is very fast and offers video downloading in variety of format. Just enter a video URL in the textbox on the site from YouTube, Facebook, DailyMotion, Vimeo and other video websites, then click the “Catch” button. The online tool will display all the available links for different format that can be downloaded for this video. Plus, you can download “Catchvideo helper” extension for your browser to catch video links. The sites introduced above are all free to use and can be used on any browsers. However if you want a more safe, reliable and fast YouTube Video Downloader, we recommend you to install desktop software i.e. Fucosoft Video Converter, which will do a consistently good job and let you download complete playlists or channels from YouTube with one link. Visit YouTube via your browser and find the video you want to download, then copy its URL. Launch Fucosoft Video Downloader and click “Download” section in the top, then click “+ Paste URL” in the upper-left corner. Select format and resolution for the downloaded video in the pop-up window, then click “Download” to start downloading.